Summary: The sign in front of the shabby tent at the end of a row of booths at the Coven Tree church Social read “Thaddeus Blinn, I can give you whatever you ask for only 50 cents.” Only four went into Blinn’s tent: Stew Meat (Stewart Meade), the owner of the general store; Polly Kemp, who spoke her mind freely and cruelly; Rowena Jervis who loved Henry Piper, a traveling salesman; and Adam Fiske whose family farm had no water. Mr. Blinn, a fat little man with eyes that seemed to glow, gave each person a card with a red dot on it in exchange for 50 cents. “Each card will grant only one wish, so think carefully before making it. When you’re ready, press your thumb against the red dot” And with that the Wish Giver was gone and the four, wondering if they had been hoodwinked, went their separate ways. Polly, Rowena, and Adam make wishes that have instant, unexpected, and finally, dire consequences. Only Stew Meat with the 4th, unused card can save them from the Wish Giver’s magic. Literary elements at work in the story: This has the feel of a fable or folk tale. Stew Meat is the narrator, setting the stage by recalling the history of Coven Tree where covens of witches used to meet and the Devil himself walked about. The situations are humorous, the writing straight forward. It’s good for reading aloud. Theological Conversation Partners: “Be careful what you wish for” is an adage that occurs frequently in literature and life. Three wishes are a basic part of many fairy tales. Wanting something we do not have-fortune, fame, beauty, or just a day at the beach or a new dress-is part of almost everyone’s life. It’s a game we often play when we talk about winning the lottery. The Wish Giver is a funny, yet thought provoking way to examine wishing and, more significantly, what is most important to us in life. Scripture gives guidance about how our deepest desires affect out hopes and wishes. Psalm 37:4 and Matt.6:33 remind us that when our first priority is God, God will give us the desires of our hearts. Have you ever wished for something? What? Do your wishes change as you grow older? Would you have given Thaddeus Blinn 50 cents for a wish? Who do you think he was? How was Polly Kemp’s wish granted? Were the results what she expected? And what was the outcome of removing her wish? How was Rowena’s wish granted? What results had she expected? What was the outcome of removing her wish? How was Adam’s wish granted? What results had he expected? What was the outcome of removing his wish? Is there danger in getting what we want too easily? Do we always know what we want? Christians are called to live in hope. How are hoping and wishing different? Scripture suggests that if we put God’s will first, God will add all good things to us. What do you think these good things are? Do you wish for any of them? Are wishing and prayer alike? If so, how? 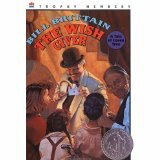 The Wish Giver by Storypath is licensed under a Creative Commons Attribution-NonCommercial 4.0 International License.